Chair Deputy of the Audit Board of Republic Indonesia (BPK RI) Prof. Dr. Bahrullah Akbar, M.B.A., C.M.P.M filled out a public lecture at Syiah Kuala University, with the theme, the Role of the BPK in Encouraging Accountability Transparency in Management of State Finance in the Unsyiah FKIP Hall. (Thursday, 2/14). Deputy Rector I Unsyiah, Prof. Dr. Ir. Marwan in his speech, said, Unsyiah felt very honored for the visit and willingness from BPK to fill the Public lecture at Unsyiah. According to Marwan, this activity is a transfer of knowledge that is quite effective for Unsyiah students. Because they can ask questions and get knowledge directly related to the supervision of state finances by BPK. Marwan also said that BPK's duties were very important in overseeing state finances. Considering that our country's budget is in the amount of thousands of trillions, so a good supervision system is needed so that large funds are used effectively. "We all know that the BPK's duties is not easy. So through sharing knowledge today, we hope that we will open our minds more about the duties and functions of BPK, "said Marwan. Bahrullah explained, this public lecture aims to provide understanding among academics such as students related to how the BPK works. According to him, so far the BPK has continued to strive to ensure that state finances are used on target and not corrupted, so that people really feel the benefits. Bahrullah said, the BPK in carrying out its duties had three types of checks, namely financial checks, performance checks and checks with specific objectives. The BPK also strives for the principles of accountability and transparency to be carried out well, because these two things are the main keys in financial management. Bahrullah also invited the public to support BPK in order to work more optimally. 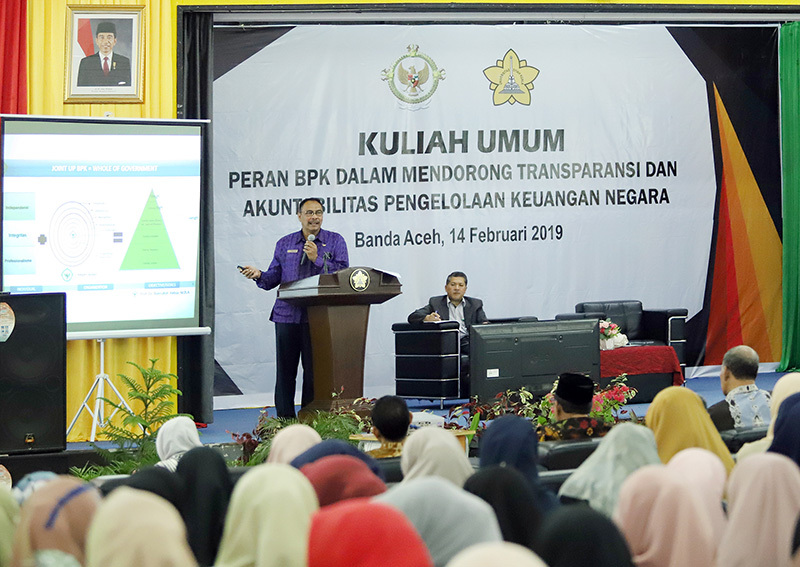 On the other hand, Bahrullah revealed that the community or government institutions need not fear if it is examined by the BPK, as long as the management of the budget is implemented, the applicable provisions. "So you don't need to be afraid to BPK. Because this institution encourages a transparent and accountable government. Not to find out a fault, "he said. Also attending the event were Deputy Rector II Unsyiah Dr. Ir. Agussabti, M.Sc, Deputy Mayor of Banda Aceh Zainal Arifin, Acting Secretary of Aceh Region Ir. Helvizar Ibrahim, as well as the BPK Aceh Representative (Unsyiah / Ib Humas).